Alcatel has announced a slew of new phones and tablets, with the hope that its Pop range is colourful enough to rise above the rest of phones released at this year's MWC. First up is the Alcatel OneTouch Pop Fit, which is a phone that you can wear. And by wearing it, Alcatel means you can strap it to your wrist. Like a watch but it's a phone. Crazy. The Pop Fit screen is a mere 2.8-inches, it comes with a 2MP camera and NFC compatibility. A dual-core 1GHz CPU will make sure it keeps chugging along as you, well, chug along trying to get fit with a phone tied to your wrist. As it is for fitness fantatics there's 32GB of space to store pumping music, the RunKeeper app pre-installed and GPS activity tracking on board. If fitness isn't your thing then speed might be. 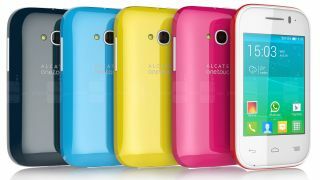 The Alcatel Pop S3 offers quad-core processing, Full HD video recording, a 5MP camera and a 4-inch screen – as well as 4G/LTE connectivity. And if you don't like the idea of a 4-inch screen, the Pop S7 has similar specs but offers a 5-inch qHD IPS, while the Pop S9 offers a whopping 5.9-inch screen and ups the camera functionality to 8MP. If you want to go for a full seven inches then the Pop 7S is a tablet that boasts a quad-core processor and prides itself on being a mere 8.9mm thin. And now for the colours. So many colours - all currently blinding eyes in the Catalan sun. The Pop range comes in Red! Hot Pink! Slate! Fresh Turquoise! Flash Yellow! Finally, if you want style over speed over stupid marketing fluff about strapping a phone to your body like it's a new thing, then the Alcatel Idol 2 and Alcatel Idol 2 Mini are the 'droid phones you are looking for. Coming complete with a 5-inch 720p IPS display, 1.2GHz quad-core processor, 8MP camera, Android 4.3 and 4G, the Alcatel Idol 2 brings both premium design and smart styling, according to Alcatel. This means that it has a metal design that's available in white, slate, cloudy and chocolate shades. Chocolate shades? That sounds like the worst invention in the world, given that chocolate melts in the sun. All handsets will be released kicking and screaming into the wild soon.